The T.P. Trailers 358 NASCAR Modified 30-lap feature also went down to the wire. Tim Buckwalter, who recently returned to the track behind the wheel of the Norm Saxton-owned No. 24, held off veteran campaigner Frank Cozze’s closing lap bids to claim his first win of the season and his second career win to become the 12th different winner in the division. 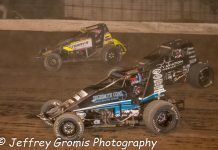 Buckwalter thanked his owner, who Tim was actually directed to him through fellow driver Billy Pauch, and all his crew for their countless efforts. Two new names were added to the books in the 25-lap NASCAR Sportsman features. Steve Young, driving the Marshall’s Home Comfort Services No. 187, narrowly beat out runner-up Jim Housworth by 0.068 second to record his first ever career victory. The event was the race rained out from the August 19 portion of the show. The Sportsman feature from the regular segment was closer yet. In the photo finish win, sophomore racer Derrick Smith, piloting a 602 crate engine crossed the line 0.029 seconds ahead of defending point champion Jordan Henn. Smith, who didn’t expect to be in the winner’s circle had no idea that Henn was there until the end. All feature winners received monetary awards from T.P. Trailers and product vouchers from VP Racing Fuel providing all necessary requirements were met. Shuey, Buckwalter, Young and Andrew Kreis were the recipients of the Dan’s Deli ½-way hoagie bonuses. The Late Model feature saw Shuey shoot past polesitter Lou Egrie Sr. to put the Scott Lee owned car at the head of the 17-car starting grid trailed by Egrie Sr., Bryon Sipe, Jordan Knepp and Steve Todorow. In no time Shuey had a comfortable lead built up and by the sixth lap encountered slower-moving traffic. The first and only caution was when Shawn Horning spun in the second turn on the 13th lap putting the field right on Shuey’s bumper. Shuey turned it up a bit on the restart since by this time Schutz, who started eighth, was in the runner-up spot giving Shuey no margin to error. The former point champions were nip ‘n tuck as the pair put on a fierce side-by-side duel. Schutz would edge ahead slightly, but when the lap counted Shuey was the leader. It was anyone’s guess as to what the outcome would be, but when the checkered unfurled Shuey was the one that pulled into the winner’s circle beating out Schutz by inches. Todorow was third followed by Egrie Sr. and Drew Weisser. Bobby Gunther-Walsh quickly took the early lead at the onset of the T.P.Trailers Modified feature. Brett Kressley, while running sixth, spun in the second turn and collected Jared Umbenhauer and Jeff Strunk ending the night for all three on the fourth lap caution. 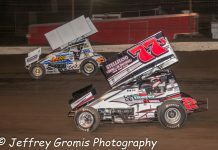 Gunther-Walsh held his pace when action resumed with Buckwalter pressuring him. 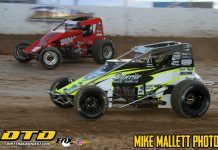 The lead changed on the sixth lap when Buckwalter motored into first leaving Gunther-Walsh, Mark Kratz, Steve Swinehart, Ryan Grim and John Willman in a five-car battle for second. Five laps later Buckwalter had a commanding lead built up and it was now Swinehart in pursuit. The field regrouped when Brian Krummel, a feature winner this year, spun in the first turn for the second and final caution. Buckwalter wasted no time moving out on the restart to maintain his spot. With ten laps to go, 16th-place starter Cozze overtook second and used the lap cars to his advantage to close the gap and quickly catch Buckwalter. As the laps wound down Cozze was getting closer and closer to Buckwalter. Buckwalter was determined to keep Cozze behind him and he did just that. At the drop of the checkered he earned a hard-fought battle with Cozze, S. Swinehart, posting his best finish of the year; Willman and Doug Manmiller chasing his across. Gunther-Walsh, S. Swinehart and Kratz won the heats. Danny Erb, returning for the first time since his health issues several months ago, won the consi. In the rained out August 19th Sportsman feature, Andrew Kreis led three laps before Young took the outside lane off turn four and became the new leader. While Young showed the way, Kenny Bock and Kreis diced for second with Ryan Higgs, Jack Butler and Kyle Lilick jockeying for the remaining positions. Jack Butler overtook second on lap 13 to challenge Young, but his night ended when the engine left go nine laps later bringing out the yellow. Mike Lisowski, who had previously took over second had to pit since smoke was bellowing out his car. Their misfortune put Housworth in second and he made several attempts to pass Young the final remaining laps. Housworth tried many moves to pass Young, but each one failed and Young went on to collect the win. Housworth had to settle for second followed by Bock, K. Lilick and Jordan Henn. The second Sportsman feature saw Kreis once again take the early lead and he stayed glued to the bottom while action him was hot and heavy for the remaining spots between Smith, Bock, Louden Reimert and Dylan Swinehart. A fourth turn tangle between Kyle Lilick, Housworth and Ryan Shupp brought out the yellow on lap 18. On this restart Smith charged to the front of the pack leaving Reimert, Henn and Ryan Lilick battle for second which gave Smith some breathing room. Henn passed Reimert with two to go and was all over Smith pressuring him for first. Smith never surrendered the lead and went on to narrowly claim a well-deserved win followed by Henn, Reimert, R. Lilick and Craig Whitmoyer. 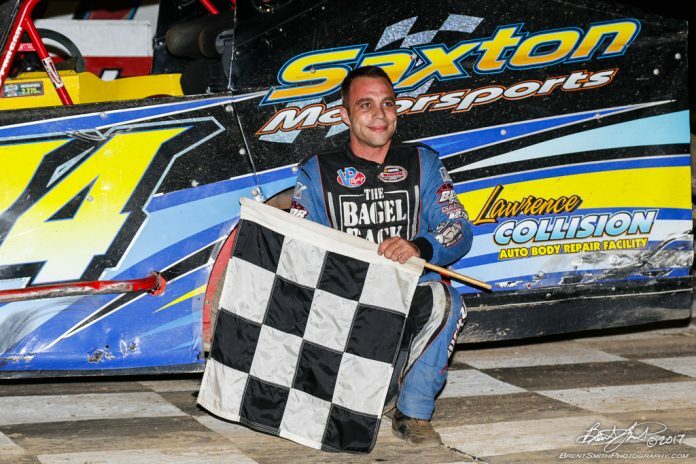 Brad Grim won the August 19 consi. Heat winners in the regular show were John McGovern, Smith and Bock. Lisowski won the consi. Coming up on September 2nd is four division show of racing that will include the TP Trailers Modifieds, BRC Late Models, Sportsman and Blast from the Past Vintage racers. In addition the Modifieds will run in two 30-lap features including the rained out feature from August 19th. Again adults pay just $15 while youngsters 11 and under are admitted free. Advance tickets for the 47th Annual Freedom 76 Run in Memory of Bruce Rogers will be on sale each Saturdayleading up to September 16th. Advance tickets are $35 for adults. On race day the tickets will sell for $40. Lap sponsorships are available for the Freedom 76 and are available for just $20. See Tina Rogers or Tommy Kramer at the track or contact Ernie Saxton at 215.752.7797 or Esaxton144@aol.com. BRC NASCAR Late Model Feature (30-Laps): 1. Brian Shuey, 2. Chuck Schutz, 3. Steve Todorow, 4. Lou Egrie Sr., 5. Drew Weisser, 6. Steve Wilson, 7. Jordan Knepp, 8. Dan Hoffman, 9. Dallas Breidenbach, 10. Dirk Rimrott, 11. Bryon Sipe, 12. Shawn Horning, 13. Wayne Pfeil, 14. Todd Ravel, 15. Andy Cassel, 16. Patrick Robinson, 17. Danny Snyder. T.P. Trailers NASCAR Modified Feature (30-Laps): 1. Tim Buckwalter, 2. Frank Cozze, 3. Steve Swinehart, 4. John Willman, 5. Doug Manmiller, 6. Duane Howard, 7. Ryan Grim, 8. Mike Gular, 9. Mike Mahaney, 10. Kevin Hirthler, 11. Craig Von Dohren, 12. Danny Erb, 13. Addison Meitzler, 14. Ray Swinehart, 15. Bobby Gunther-Walsh, 16. Clay Butler, 17. Brian Krummel, 18. Kory Fleming, DNF: 19. Joe Fanelli, 20. Mike Laise, 21. Brett Gilmore, 22. Chris Esposito, 23. Chris Gambler, 24. Mark Kratz, 25. Brett Kressley, 26. Jared Umbenhauer, 27. Jeff Strunk, 28. Justin Grim. DNQ: Ron Seltmann Jr., Dan Waisempacher, Briggs Danner, Meme DeSantis, Colt Harris and Kenny Gilmore. NASCAR Sportsman Feature (August 19 rainout) (25 Laps): 1. Steve Young, 2. Jim Housworth, 3. Kenny Bock, 4. Kyle Lilick, 5. Jordan Henn, 6. Craig Whitmoyer, 7. Mark Kemmerer, 8. Andrew Kreis, 9. Dylan Swinehart, 10. Ryan Beltz, 11. Derrick Smith, 12. Gary Wagner, 13. Louden Reimert, DNF: 14. Brian Hirthler, 15. Brad Arnold, 16. Kurt Bettler, 17. Brad Grim, 18. Mike Lisowski, 19. Jack Butler, 20. Joe Funk III, 21. John McGovern, 22. Ryan Higgs, 23. Lex Shive, 24. Ryan Lilick. DNQ: B. J. Joly, Sean Weiss, Andy Clemmer, Zak Wydra, Nathan Mohr, Scott Kohler, Jesse Landis. NASCAR Sportsman Feature (25 Laps: 1. Derrick Smith, 2. Jordan Henn, 3. Louden Reimert, 4. Ryan Lilick, 5. Craig Whitmoyer, 6. Dylan Swinehart, 7. Mike Lisowski, 8. Brad Grim, 9. Andrew Kreis, 10. Joe Funk III, 11. John McGovern, 12. Kenny Bock, 13. Ken Eckert, 14. Kurt Bettler, 15. Ryan Beltz, 16. Ryan Higgs, 17. Nathan Mohr, 18. Brian Hirthler (provisional), 19. Jesse Landis, 20. Kyle Lilick, 21. Ryan Shupp, 22. Sean Weiss, DNF: 23. Jim Housworth, 24. Mark Kemmerer, 25. Gary Wagner. DNQ: Andy Clemmer, Brad Force, Steve Young, Brad Arnold, B.J. Joly, Lex Shive, Jack Butler. COMING EVENTS!!!! Saturday, September 2, 7:30 p.m. TP Trailers 358 Modifieds, BRC Late Models, Sportsman and Blast from the Past Vintage Racers plus Modified feature rained out on August 19th. Saturday, September 9, 7:30 p.m. WNPV Radio Champion’s Night (final point races), TP Trailers 358 Modifieds, BRC Late Models and Sportsman. Friday, September 15, 7:00 p.m. Sportsman stock cars and Mid-Atlantic Sprint Series plus Modified practice. $12 for adults and $5 for youngsters 6 through 11. Under 6 admitted free. This event has no rain date. Saturday, September 16, 7:00 p.m. 47th Annual Freedom 76 Modified Classic in honor of Bruce Rogers, $30,000 to win. Rain date September 23- Advance adult tickets are $35 at the track and $40 on race day. Youngsters 6 thru 11 pay $10 and kids under 6 are admitted free. Rain date is September 23.